The S.E.A. cultural show was the first show hosted in the National Theatre. It’s such a beautiful landmark in the past located at the River Valley Road. 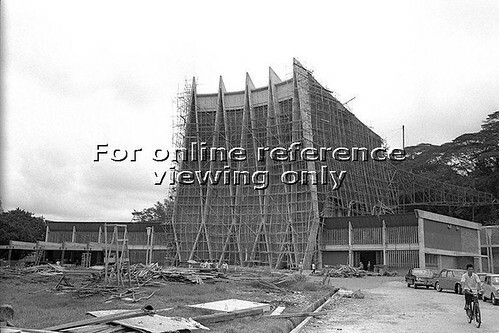 It was built to commemorate Singapore’s self-government costing about S$2.2m and completed in 1963. The public also contributed through “a-dollar-a-brick” campaign via song requests made on radio then. Above both photos credit : National Archives of Singapore, PICAS. 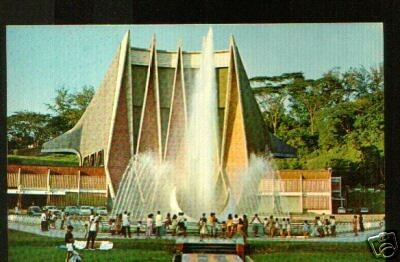 Now how many of us know that the five-pointed facade represented the five stars of the Singapore flag while that unique fountain was supposed to represent the crescent moon. There was a revolving stage and the theatre inside was actually semi-open air at the rear. I don’t understand why the government has to tear down the building. The place is now an empty piece of land and has not been used since the building was torn down. Back in those days, Singapore University held their convocation there. By the time I graduated, we have to use the Singapore Conference Hall. I had my graduation ceremony there. I think it had to be demolished becos of safety considerations. Thousands of Sporeans of my generation and tourists have had photos taken in front of that fountain. I attended a cultural show in 1963 featuring South East Asian countries. I think it was held over a week. As my father got an invitation to attend, I was dragged along. That was my first experience sitting in an open-air theater watching Asian cultural dances – lion dance, Indian dance, Thai dance. There were plenty of floor standing fans providing relief to the audience. I think it was too heavy for me and until to this day, I dread watching such shows. I am not too perturbed that they pulled it down – It’s was like living in hell. I am writing a paper about the 1963 Cultural Festival. I have found a souvenir programme. Can you help point me to other information? I found your Godfather’s souvenirs interesting. 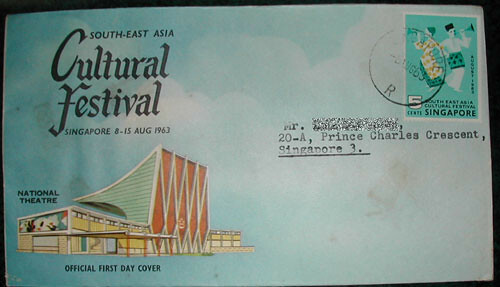 I live in the UK but I’m coming out to Singapore soon and had hoped to revisit the National Theatre because I was in a Company who did a show there back in 1973. I was so looking forward to seeing the place again and reliving old memories….what a shame!! Welcome here. It’s really sad to see the Theatre and it’s beautiful fountain gone with the wind! 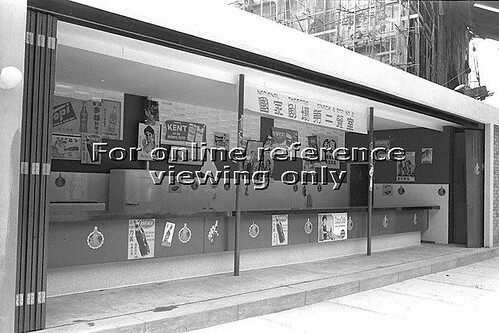 Hi, I am currently doing on the significance of Singapore Theatre and its architectural identity. Do have more information on that and any references? Hi. I was very interested to see these posts. I am a graduate studnet from NUS and we are currently doing a project on the National Theatre for a module. We are hoping to make a short documentary film in whihc we can interview people about their memories of the National Theatre. The aim of teh project is to see what people remember of the National Theatre and how they remember it. If any of you are interested in helping us with this project, please email me at siberian_railway@yahoo.com.sg or call me at 81796221. Even if you are not willing to be intreviewed on film, we would still really appreciate it if you answer some questions via telephone or even via email. Thank you very much! Your help would truly be appreciated. Please do spread this information to others who might be able to hlep us with this project as well! Anyone else can help, pls drop her an email. Thanks.